The terms contained in this disclaimer apply to use of the website (https://www.webshop.fairboost.nl/) belonging to FairBoost BV (hereinafter referred to as FairBoost). By visiting this website and using the information offered on this website, you agree to the applicability of these terms. If you do not agree to these terms, please do not visit the website or use the information provided through this website. FairBoost would like to inform you that these terms may be changed at any time. You are therefore advised to regularly check this disclaimer. The information on this website is meant for the sole purpose of providing general information. Although the information has been put together with care, FairBoost cannot vouch for the correctness, completeness or topicality of the information offered. FairBoost can, at any time, change the information offered, requiring no further explanation. FairBoost is in no way responsible for any damage as a result of the use of the website, including – but not limited to – damage as a result of viruses or bugs or the incorrectness or incompleteness of the information. 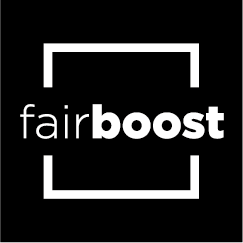 FairBoost is not responsible or liable for the contents or reliability of third-party websites to which the FairBoost website refers, through hyperlink or otherwise. Copyright. All rights reserved. All copyrights and other intellectual property rights to texts, images, audio, software and other materials on this website are the property of FairBoost and its affiliated companies or have been included with the permission of the owner in question. You are permitted to browse through this website and to reproduce fragments by printing, downloading to a hard disk or distribution to others, but only for the purpose of providing information and on the condition that the aforementioned copyright statement is included in all reproductions. No reproduction of any part of the website may be sold or distributed for commercial purposes or be altered or included in any other works or publications, either in printed or electronic form, including sending it to another website, including it in another website ('framing') or linking other websites to this website, unless prior permission has been granted. Neither license, nor any other rights will be granted. All images used on this website are the property of FairBoost and its affiliated companies or are used under license. Use of any trademark used on this website is strictly forbidden, unless prior written permission is granted by FairBoost.